Learn five different ways to bench press, starting with the most basic form. These bench press techniques range from beginner level to expert. Watch demonstration videos to learn how to perform these workouts correctly. If you’ve never learned how to do a bench press before or you’re eager for some variations, look no further! Below, you’ll find videos and tips on how to perform five different versions of a bench press. These workouts vary in level of ability, and all versions will at least work your chest, shoulders, and triceps. The last type of bench press is for expert-level exercisers who want to work more than these three muscle groups. But before we give too much away already, you’ll just have to scroll down and see for yourself! 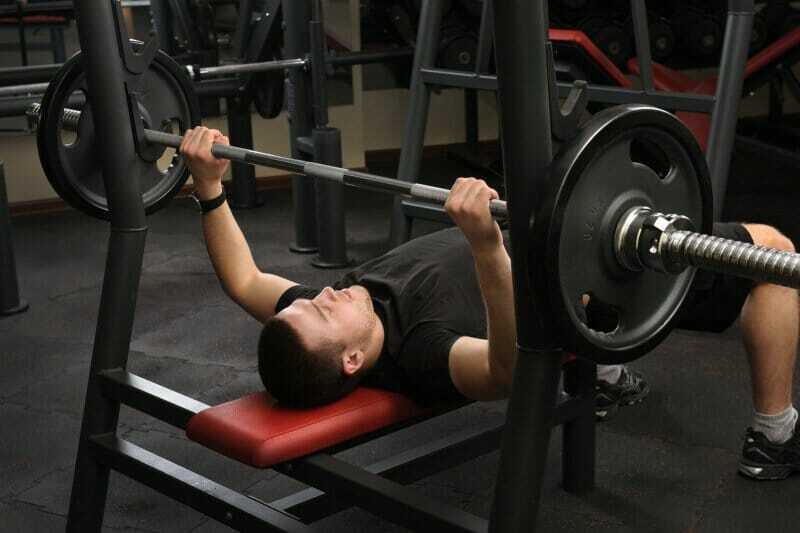 For the bench press, lie down on a flat bench. Lift the bar up above you, keeping your arms locked and your shoulders in place. Then gradually lower the barbell down until it reaches your chest, all while you inhale. For the exhale, raise the barbell back to where you started, using your chest muscles (moving faster than how you lowered it). Then lock your arms, squeeze your chest, and slowly lower the barbell again. For a necessary, in-depth demo of the correct form and technique for this exercise, please watch the video of Dean Somerset above. If you’re new to the bench press, ask someone to spot you while you unrack a barbell. It’s important that you get the most out of this workout while avoiding injury! The incline dumbbell bench press involves an incline bench with a dumbbell in each hand. Start with the dumbbells on your thighs — palms facing each other — and lift each weight one at a time to ensure you’ll hold them shoulder width apart. Turn your wrists so your palms face away from you, at an angle like in the video. Then follow the same steps as a regular bench press: Use your chest to lift and lower, lock your arms with each lift, and lower at a slower speed. The main (if not only) difference between the decline bench press and the basic bench press is that you lie down on a decline bench. This exercise pushes you to fight against gravity more than before. But despite the decline, you still have to lock your arms and keep them perpendicular to the floor. It’s a challenge, but you can do it! Moving back to your flat bench, perform the wide-grip bench press with palms facing forward like always…but with a grip wider than shoulder width. The wide grip, of course, is the kicker here and what makes this workout an especial challenge. Other than holding a wider grip, follow the same rules of a basic bench press. The triple-stop bench press is a bench press in phases, and your middle back and forearms will get in on the action with your chest, shoulders, and triceps. This move requires an extra amount of strength and control, so this isn’t a workout you just jump into before you’re actually ready. It’s called “expert level” for a reason! Once you have your barbell above you with arms locked, inhale and lower the barbell down just a few inches, and hold for 10 seconds. Then lower it some more until it’s about halfway from the starting position, and hold for 10 more seconds. With one final lowering phase to go, move the barbell down to just a few inches from your chest, and hold for another 10-second round. Finally, lift it back up to the starting position. It’s not so bad…right? Track bench press workouts and more when you sign up for our annual PRO plan. With our advanced stats in a convenient app, it’s never been easier to stay motivated and meet your fitness goals!